Increasingly globalized economies and profound technological shifts are placing enormous pressure on the skills that people must bring to the workplace. In the case of girls and women, these stresses are compounded by constraints that stem from social norms and labor market structures that shape labor force participation, livelihood, and earnings. 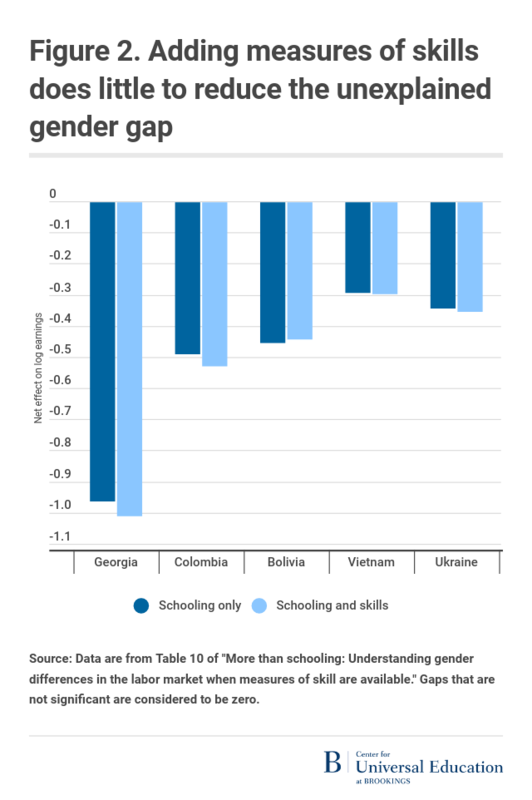 Despite convergence in schooling levels between men and women in many countries, gaps in earnings and labor force participation between men and women persist. 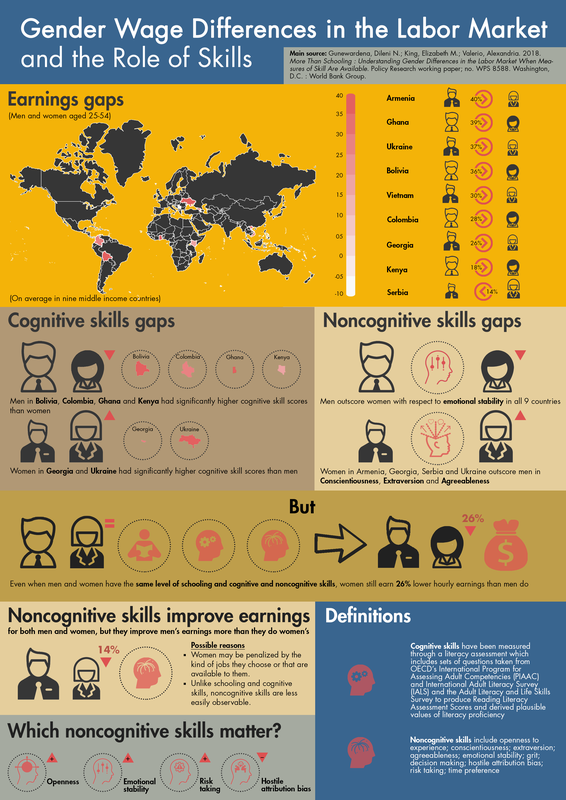 Are differences in cognitive and noncognitive skills the missing piece of the puzzle? Using a unique database on developing and emerging economies that contains individual measures of education as well as cognitive and noncognitive skills that have not been typically available for these countries, we revisited the important question of why women continue to earn less than men do, controlling for individual characteristics. The comparable surveys were part of the World Bank’s Skills toward Employment and Productivity (STEP) program, a cross-country initiative to measure adult skills in low- and middle-income countries. The STEP data include a direct assessment of literacy proficiency and related competencies, and many personality traits or noncognitive skills. Between 2012 and 2014, the STEP survey instrument was fielded in 13 countries, plus in Yunnan, a province in China. With the STEP data, we were able to examine how education and different types of skills are rewarded in the labor market and how those rewards differ for men and women. There is a lot of literature on the gender gap in employment and earnings, but the literature that investigates the role of cognitive and noncognitive skills is still small outside advanced countries. We found many similarities across the STEP countries spanning four world regions, despite their differences in GDP per capita, average schooling levels, demographic characteristics, and economic structures such as the employment shares of their informal and formal sectors and industrial composition. Gender earnings differences arise in part because men and women possess different levels and types of education and skills and in part because labor markets value their schooling and skills unequally. Our study affirms that schooling, especially post-secondary schooling, and cognitive skills are important for increasing earnings for both men and women, but they are especially important for women. A year of post-secondary schooling increased earnings for women on average across a sample of eight middle-income countries by 18 percent as compared to 12 percent for men, and by as much as 38 percent for women compared to 28 for men in Kenya. A one-standard deviation increase in cognitive skills increased earnings by 12 percent for men in Bolivia, and by 19 percent, 14 percent, and 10 percent for women in Georgia, Kenya, and Vietnam, respectively. We also found that, across a sample of eight countries, both men and women have positive returns to noncognitive skills, in particular, to one’s openness to new experiences and risk-taking behavior and are penalized for hostile attribution bias (the tendency to interpret others’ behavior as threatening or aggressive). Women are also rewarded with higher earnings when they score higher on emotional stability (predictability and consistency in emotional reactions, with absence of rapid mood changes), conscientiousness (the tendency to be organized, responsible, and hardworking), and extraversion (sociability, the tendency to seek stimulation in the company of others, talkativeness), while men are not (Figure 1). At the country level, patterns across countries differ regarding which skills are valued in the labor market and which skills obtain different results for men and women. 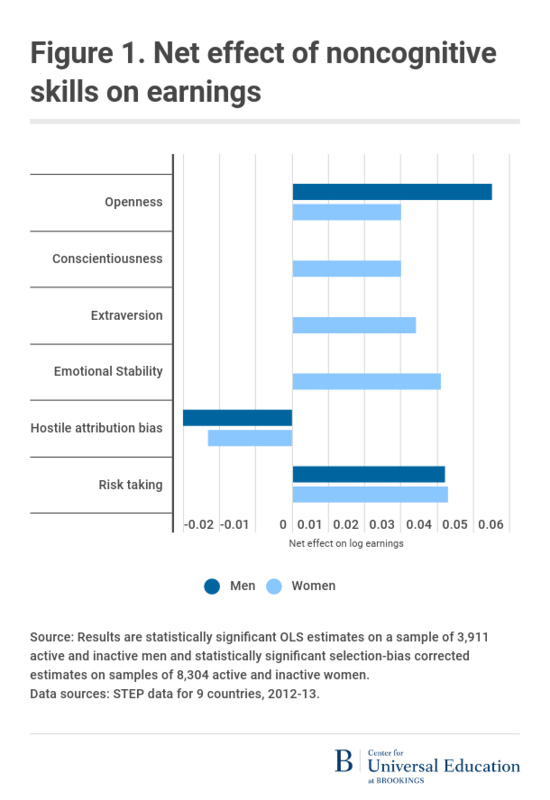 However, we found that openness, risk-taking, and hostile attribution bias matter in predicting earnings for both men and women across several countries. While cognitive and noncognitive skills help to reduce the gender wage gap in some countries, our results show that women are disadvantaged not so much by having lower human capital than men, but by wage structures that reward women’s human capital systematically less than men’s. For example, the inclusion of cognitive and noncognitive skill measures reduces the unexplained gender wage gap in Bolivia, but increases it, or leaves it unchanged, in Colombia, Georgia, Ukraine, and Vietnam (Figure 2). This suggests that while there are gender differences in labor market rewards to cognitive and noncognitive skills on the earnings of men and women, these differences favor men overall (except in Bolivia). Our results support the view that schooling is a smart investment, especially for girls who complete secondary and post-secondary education. The results make a compelling argument for more effective investments that improve learning and education opportunities for girls. Finally, although both men and women benefit from enhanced cognitive and noncognitive skills, the expected gains to women from skill acquisition may not be fully realized without policies that address gender disparities in earnings structures.